Last summer @fiddich1980 provided 3 mystery samples for me and for @paddockjudge. This was sample B. We blind tasted them together over Facetime in the fall, and after writing preliminary notes the identities were revealed. Tonight I completed my review notes with the sample. I don’t remember if I gassed it. It was a newly opened bottle when the sample was made and the 2 oz bottle was about half full when I poured it tonight. In the fall I noted a hint of sulphur, the sense of rotting vegetables which seemed to dissipate with air, and a vegetal note that remained. It was fruity with a hint of rhubarb ( I think I may have overscored it back then). Tonight I get rich, dark fruits like prunes. A warm smell. Vanilla in the background. The vegetal note is almost non-existent The sherry here is powerful. A little thin on the arrival (likely a result of the low ABV / dilution). I got an alcohol nip in the first tasting that seems to be less prominent now (until the development). Sweet and sour. Fruity (dark, dried fruits) and a little spicy. Medium long Spicy, red wine on the exhale (tonight). Not bad. Fairly well-balanced, if a little underpowered on flavour and mouthfeel. I’m very impressed at the change in score from the first taste until today. I’m convinced that it must have been air exposure and time, as the bottle was freshly opened when the sample was made. Interestingly, I tried this from the same bottle about a month after the sample was poured at @fiddich1980’s tasting and it was my favourite of the age-stated glenfarclases. I scored the blind tasting of Glenfarclas 21 YO 75/100. @paddockjudge Did you have any left over? Have you had a chance to revisit? 3 weeks after opening bottle. Now, after three weeks, it seems to have opened up. From my experience, keep everything at room temp. Shy away from using an ice cube, I would recommend not using a whisky stone if you typically do. If you use a splash of water, don't use cold water. I have no scientific explanation for this finding, just my own experience. Nose-23: Sparkling grape juice from a distance, warm barley and butter as you bring your nose closer to the glass, red candied apple as you bring your nose even closer. Interesting how the aromas change from various distances. Balance-23: Superbly balanced. Despite having strong distinct flavors, the transitions from flavor to flavor, and through the finish are long and smooth. Typical Glenfarclas profile, but somehow less than the sum of its parts. This bottle has been open for some years and may have lost some volatiles, but I don’t remember being impressed with this when it was newly opened. Nose: Oak, malt and sultanas along with some liquorish like bitterness. Taste: Well melded flavours which mirror the nose. The liquorish notes might be tending to creosote. Finish: Long full and satisfying. I like the Glenfarclas range. Family run, independent, do what they do well, no "whacky" experimental bottlings in bright pink bottles with funky lables. Sherried Speyside how it should be. In my mind they are the bench mark for Sherried Single Malts. The 21 is a great example at a very reasonable price. Nose: Honey, Sherry, creamy, oak, vanilla, leather with a wisp of smoke. Palate: It has a wonderful smooth start almost creamy, flavours of sticky dark fruits like plums and raisins, spiced dates and gentle smoke. Peppery bite and some nutmeg. Finish: A good length (medium to long) which as a gentle spice, very light smoked fruits and sherry tang. Tasted this at a posh hotel in Portland and it won my heart. I just loved it. Bought a bottle about six months later and didn't like it at all. Again, I think the older bottlings were much better. I own a bottle of the 40 year. No plans to open it soon. I hope that when I do, it lives up to my expectations. I've never tasted the 40 at a pub, or anywhere else for that matter. Too expensive. I purchased my bottle for $439 last winter in a wind storm that blew my jeep off the road. I drove 120 miles to get it and really enjoyed the drive because I was off in search of "treasure." Any drams I've seen for sale are about one fifth of what I paid for the bottle. When I picked up the bottle, the clerk said, "Have you tasted it?" after I bought it. I said no. She said, "Well, some old guy bought one last week and he came in yesterday. He didn't like it much." I like to think that old guy was wrong. We shall see. Thank you for the very nice and helpful review. Short n sweet, but no less effective and helpful. Very cool. @rigmorola Thanks for the feedback. I have some odd memories from Portland (Maine)involving a bar with lots of table football tables and a barber who was 100 yrs old and cut my hair with a comb and straight razor! The 40 is lovely, it was on my hit list for a while. As with any 40 yr old it needs time to breathe in the glass. I love way you called it a search for "treasure". I know exactly what you mean. I love finding new Whisky stores, they are like Aladdin's caves. There’s nothing unexpected here—it’s mostly the usual suspects of malt, caramel, vanilla, and sherry—but its classic flavors are exceptionally clean and articulate. This one screams “Speyside!” from nose through finish, even as it says “Highland Malt” on the label, which is why I usually avoid stereotyping Scotch whiskies by region. Review based on my fifth dram from a bottle opened about three weeks. Nose: Let it sit for a few minutes to get rid of the dusty notes. The expected aromas (see above) arrive soon after, thick and dense. The sweetness underscores everything as some soft medicinal and minty notes emerge. Oak wood and cinnamon after several more minutes. A rich, ever-evolving nose. Palate: Seems a bit bitter and oaky on the arrival, but it soon develops into something equally malty and peppery. More sherry and some butterscotch as it sits. A slight shortcoming is that as the flavors become more intense, so too does the waxy consistency that somewhat overwhelms the flavors. I suspect that upping the ABV to at least 46% would help develop the flavors and diminish the texture. The finish is of only medium length but packed with flavors. Malt, vanilla, honey, sherry, as expected, along with cashews, lemons, oak, a peppercorn medley, and a final fadeout of chocolate mint. Another 30 seconds on the finish and another 3% ABV might elevate Glenfarclas 21 to near-perfection. As it is, it’s merely damn good. A must-try if you enjoy anything in the Glenfarclas range. Thanks for a great review. How would you compare it to the 15 and 25 ? Nose: Peach/caramel/nut, overall. You can sniff off through layers: Thick nuts (almond or cashew) and salty butter. Then the main theme of fresh butter and peach. Peach becomes syrupy caramel, then vanilla, which softens to green grape. Let the vapors replenish and repeat! Very smooth; and you can give a good inhale without burn. Palate: Luscious almond-infused juice of peach and sour cherry, with caramel. (Rather like persimmon.) Becoming fresh butter and red apple with some oaky vanilla and earthy tobacco. Very good and very even. Enjoyable flavors without noticeable flaws; those flavors could, however, be stronger, also in the finish. Within Glenfarclas, I would first compare this to the 15yo. The nose of the 15 and 21 are similar (moreso than the 25/30) and lively. Perhaps the 21 is more peach, whereas the 15 is more creamsicle. But the palate has more differences, most noticeably providing less ginger/sour punch. I would say the 21 has more dry peach-almond-caramel rather than the 15's orange-walnut-dairy. The 21 is softer and better balanced, but somehow the 15yo still calls me, perhaps with stronger flavors. My choice would depend on the occasion. Incidentally, the 21 also bears similarities to the 40yo. Compared with malts of other distilleries, I would first say this 21yo is similar to the Aberlour 18, but perhaps adding some peach/cream that I found lacking in the Aberlour (although at the sacrifice of some perky zest). I find the 21yo marginally better. The Glenlivet 25 is also similar, but shows more zest and less dairy/nut/caramel in the palate. And the Glenlivet's finish has more raisin/nectarine rather than peach/almond. The Glenlivet probably wins out just for providing somewhat fuller flavor, but this comes at a premium. Thanks rigmorole, I appreciate the feedback. I think comparisons are one of the hardest things to provide as a reviewer, but they probably can bring the most useful perspective. So thanks for adding; it improves the review-- and gives me a chance to improve it too. I agree with your assessment of the 2 malts' characteristics: the Farc is smoother/gentler/syrupy and the Ab is sharper/zestier/playful. So I believe we're not on 2 completely different planes! But I do think they have similarities whatsoever, though... notably: orange, vanilla, almond, butter, apple, oak. So I think you could understand one in terms of the other, even if they're not "very" similar (heck, I feel like I couldn't really say that for any 2 malts...). By the way, I also mean that I find them similar in being high quality. I wonder whether you (or other Connosrs) could name another, more similar malt. And on the same topic, the Glenlivet 25 is more like the Ab18 than the Farc21. (More sharper notes, more lively.) So it is also not a perfect comparison to the Farc- but I still think worth mentioning, in case people want to explore based on liking it. Thanks for the review. I must disagree with no disrespect with your comparison between the Farc 21 and the Aberlour 18. I recently owned both bottles and saw no such similarity whatsoever. The Farc is caramely and smooth, whereas the Aberlour 18 is almost bourbonesque with a much sharper profile. I was intrigued with your Glenlivet comparison. I see the 25 sells for well over $300, however. And then we see once again the beauty and sensible luxury of Glenfarclas 21. The Glenfarclas 25 is a mere $160 where I live. Ah, what a bargain. This said, I could well prefer the 21 over the 25 depending upon my mood. I have a soft spot for the Glenfarclas 21. It is a longstanding favorite of mine. Thank you again for your time writing this very thoughtful review, vanPelt. The topic of oxidation has been a recurrant theme over the span of my most recent reviews. Although it is a process that i had some experience with, it is amazing when you realize that you've barely scratched the surface. When i first bought this 21 year old glenfarclas i was not only dissapointed, but astonished as to where the sherry-magic we associate to Glenfarclas had gone? It was all ruined by a very damp (and dominant) wood note. Like a soaked oak-lump. After a month the malt proved much more pleasant to the palate, but it was when tasting this malt over these past two weeks where it showed it's true colours (dark ones at that). It made me realize that you should be almost limitless with patience as any spirit can come to it's own after some oxygen and bottle-maturation. Nose: Forest-fruitcake alongside a pungent sherry note. Some purple grapes come forward with peppermint and rhubarb. Not a spicy nose, as honey melons brings the nose to a conclusion. Palate: Green melons and honey melons arrive first on the palate with black currant and an absorbment of spices (camomile and cinnamon). The developement can be easily summed up by Raspberry and Buckberry pie. Very smooth body throughout. Finish: The rhubarb returns alongside some black currants. Then a very vegetal note with a slight sweetness from the sherry work as a balancing act. Some wood tannins persist but the wood is surprisingly subtle, considering the age and that worrying first impression with damp wood. This whisky has been a lesson in both oxidation as well as smoothness. This lesson extends the previous lessons about patience in a big manner. This is a delicious christmas dram, question is if you have your sights on a Glenfarclas, should you buy it? Probably not, both the 15 and 105 are real beauties and are considerably cheaper. The exception might be if you are willing to try something a bit different, or simply feeling flush, then this will prove to be very satisfying indeed but only if you give it time! Also if you like your whiskies smooth then this is probably as smooth as you are going to get, as far as sherry whiskies are concerned. It is like combining Matt Monroe and Roger Moore, it really is! I love how different it is from the 12 and 15 year olds, it really has it's own definite character. I tasted this yesterday, reading your review going a few minutes over (considering the fact that i was at home and not in a restaurant) and after 30-40 minutes it becomes just delicious! Bumped it up a mark for that. This is a dram I am really looking forward to trying. Thank you for your review ! I love this whisky, it doesn't get my highest mark but it's fantastic, its an older whisky, which is delicate yet easily accessible. Nose: perfume sherry, sultanas, dates, vanilla of course, some woodsap, some smoke and oak coming through, also some floral notes, all emerging very slowly, give this one plenty of time. With Water richer, more vanilla, more toffee, more caramel. Pallet: a mellow whisky, not juicy like the 15, some old sherry notes, tobacco, leather, tannins, little bit of smoke again, it tries to go sweet as well, ginger, more raisins and deep sherry, lovely interplay. With Water more fruity flavours, sweet probably wins out here. Some leathery notes too, touch sappy. Finish: leather old wood, and some clove kind of spice. With Water more old wood notes and beautiful, cleansing vanilla. One that i would always have in my cabinet, its not too expensive (as goes with all the Glenfarcalas range) at $150 AUD. Great after dinner, great with a cigar, great by itself, its just great whisky. Last evening, I ordered a glass of the Farc 21. I must say, I was not disappointed in the least. The difference from a dram of the 17 which I'd tried a few weeks earlier at the Highland Stillhouse seemed dramatic, at least with 20/20 hindsight. I found my dram of the 21 at The Heathman hotel in downtown Portland. This establishment has great happy hour prices and a generous single malt selection. My glass cost $17 (American dollars). It was a thoroughly enjoyable experience to sip the Farc 21 before and after dinner, and then to walk up the hill a few blocks to the Portland Art Museum for an exhibit entitled, "Mythologia: Gods, Monsters, and Men." As for the scotch, it became noticeably better in the glass after thirty minutes (yes, I milked it for quite a while in "restaurant time" in which wait staff tend to puzzle over one's ability to sip a drink so leisurely in our "hurry up and wait" society). The nose on The Farc grew more fragrant and the flavor on the palate became heavenly with a rich toffee dominant note. There was much less of a sherry influence than in the 17. Vanilla bean was also present in the luxurious mouth feel, and the legs on the sides of my glass were thick and decadent, as was the color of this whisky. I must say that I did not detect any mint or peppercorns in there at all, as some reviews have stated. All in all, the dram was very smooth with a finish that helped one to feel immortal, at least for a minute or two. I refrained from taking a drink of water upon leaving my table, even though I was quite thirsty, because I could not bear to wash the last few scintillations of Farc 21 off my tongue. I've seen other reviews that make statements such as "The 25 Glenfarclas is much better than the 21 but it is twice the price." Well, this is certainly not the case in Oregon, where the price of the 21 is about $140 and the 25 is about $160. I have never tried the 25 and I probably won't shell out $160 for a bottle any time soon, but an extra 20 dollars hardly seems like much of a leap if one is already willing to spend $140 on the 21. As for my verdict on the 21, it has redeemed my appreciation and respect for Glenfarclas. I was not all keen on the 10 or the 12. The 17 is good, but it did not bowl me over. The 21, however, did. It is just fantastic. I can't recommend it enough. Who says that money can't buy happiness? Well, I guess if sipping a fine scotch equate to happiness for you, then it can when it comes to The Farc. I was certainly in Tastebuds Heaven for about 40 minutes while sitting in the Heathman, looking out the window at the winter mist and the traffic with dusk setting in, knowing that I would soon be comfortably shuffling through the museum looking at some engravings and prints from centuries past. The quality buzz from that Farc definitely helped to make the museum a warm, happy transition from one work of art to the next, with a little time spent reading the more interesting textual histories and backgrounds for the pieces. I was surprised to see that Target owns so many ancient Japanese masks in the museum's regular exhibit there. Who would have thought that Target corp would be into Japanese masks . . . then again, hmmm, maybe it does make sense in a weird Zen way. . . .
Like your motorcycle in the pic, by the way. I sold my Triumph Bonneville a few months back. Tragic decision. Should have held on to 'er. I miss Miss Bonnie. Cool review by the way. Just added this bottle to my wishlist. Fantastic explosion of caramels,toffee and sherry. With a lasting finish. The best value 21 year old on the market in my eyes. The 25 is a better bottle but at twice the price..... given a choice a 25 year old or 2 x bottles of 21 year old the 21 wins every time! I've never owned a bottle of this but I have tries a dram in a bar in Aberdeen. It is delicious and one of the very few that I have found that benefits from a drop of added water. Normally I don't put water anywhere near them. I'm quite keen to try this one. Thank you for the review. Perhaps I will try the 15 first and if I don't care for it much, the 21. Nose: very smooth, sweet sherry lighter then the 15yo, vinilla cream candy toffee's, slight note of peppermint, candy oranges/apples. Palate: Ridiculously smooth and easy, cereal grains, nice maltiness, creamy, the sherry is sweet and only moderately heavy, toffee's and some fruit cake. Finish: Big note of sweet malted Barley, slight feel of milk chocolate with high cream content, sherry is not very heavy in the finish more of a focus on sweet grains. IMO, this whisky kind of shows that a whisky can be too smooth for it's own good. Quite different from the 15 and 25 which focus more on the sherry aspect of the whisky this has a higher focus on a sweet maltiness. Nose: Lots of nose, oak and harsh wood. Of course vanilla, nuts and sherry. Taste: Again, harsh, wood, strong and bold. Bubbly and lovely. Summary: Lots of character, peppery, very nice balance. Light and a feeling of summer. Smooth and complex. Not that much sherry as hoped but still a great whisky. I received sample bottles of the Glenfarclas 21yr and 25yr with a 70cl bottle of Glenfarclas 15yr I ordered from the UK (thank you, Master of Malt!) I have finally made time to sit down with the 21yr, and give it a proper review. I am very excited about this one! Palate: Wow! Candy apple. Butterscotch candies. Spicy. Delicious. Very good. I want another sip. Maybe a bit spirited. Finish: Long, with a bit of burn. The tongue tingles with some spicy notes. Honestly, not the best finish. Is this really a 21yr Scotch? I think I like the 15yr moreso than this. The nose is excellent, and the palate is delicious, but the finish is leaving a bit to be desired. The sherry is nearly completely missing from the finish. Love the review. I see you are using Master of Malt and wonder if you would mind answering a few questions for me? Nose: Malty sweet citrus, pears, green grapes. With time, a bit of nutmeg. Palate: Floral honey, almond nougat, citrus again, salt. Easy-going in the best way. Finish: A tiny bit of smoke, not a campfire, more like a match. Pleasant. Nuttiness at the very end. This is surprisingly light for it's age and it's quite delicious. I just wish that this was bottled at 46% like the 15 year old. The flavors are delicate so the light amount of smoke is well suited and complimentary. The almond and citrus notes that I kept getting reminded me of a century old gelateria that I visit often. The smell of almonds from pistachio-almond gelato, spumoni, and pastries as well as the smell of lemons from lemon ice permeate the walls and overcome the senses. I love when a whisky can invoke such memories. nice review, this is on the wishlist, it's also a bargain for its price...how does it compare with the 15? I really love that dram! Very nice review, @Dellnola. I'll have to suss this one out sometime soon. 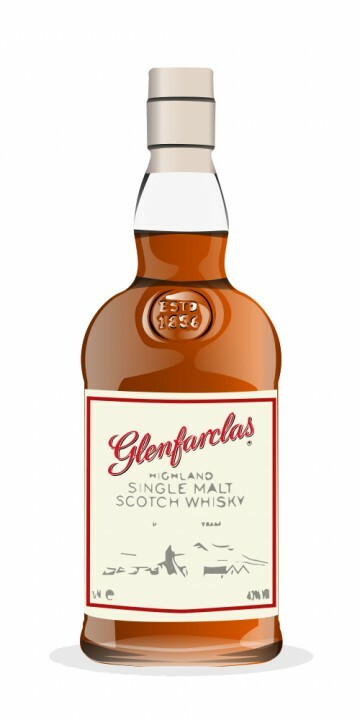 When I purchased my Glenfarclas 15 year old (based on the reviews from people on this site), it came with two small tasters of the GLenfarclas 21 year old and the 25 year old). Tonight I decided to get out the 21 year old. The nose is nutty and buttery - really meaty and savoury and rich. After several sniffs and a bit of time warming in my hand, it opens up a little bit with subtler dried fruit notes, a hint of sherry, some caramel and an undertone of peat. Fantastic! First taste is chewy, rich and lively! Not terribly complex, made up of malt, sherry, a bare touch of caramel and smoky nudge, but mouth-watering and moreish. The finish is a long warm wave that builds for several seconds but never becomes hot, just comfortably warm. The smoke is there, and as the warmth builds, the peat note from the nose re-emerges. Sherry and hints of caramel slowly fade over several minutes. This feels like a really complete, mature speyside malt. It doesn't try to knock your socks off, but boy is this both fantastic and easy to drink. I would recommend it to anyone, especially if you are worried that jumping form speysiders to drams like the Talisker 10 year old are maybe a step too far. It's not quite a 9, but it is close! @BonnieMac - It is a very cool marketing ploy to hand out the small tasting bottles with the 15. I went and had the 15 year old after the 21 last night, and they are both fantastic, but I found the 15 year old a bit punchier (it's a little bit less mature and smooth), and I must admit I enjoyed that, so that was the 1 percenter that made the difference for me. But yes, the sherry smoke in this one is probably the defining feature, and it is fantastic! I'll be throwing up a review of the 25 year old in the next day or so. I think the 21yo is soooo nice - probably my favorite of the three...and to not sound like a "yes-man (-woman?)" I'm in agreement about raising the rating to a 9. I have to say the marketing tactic of throwing the two sipping bottles in got me! The sherry smoke is loverly. I am going to order the 21yo!